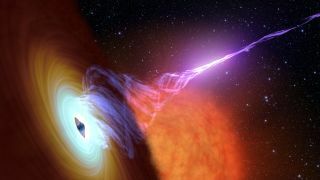 Artist's conception of a black hole with an accretion disk, and jets of hot plasma. New observations of black holes have revealed an "acceleration zone" that ejects jets of material from around the singularity. Astronomers say that in this zone, the hot gas inside the jet becomes energized enough to strongly radiate light, creating two lines of bright light along the black hole's axis of rotation. While black holes trap much of the material that falls in toward them, some of that material orbits the singularity in a whirling accretion disk. That whirling action can generate powerful plasma jets that blast outward, and now researchers have pinpointed exactly how far the particles in the jets travel before they light up with radiation. While the distance varies depending on the size of the black hole, astronomers have named this area the "acceleration zone" — an area that was not well-understood before the new observations, NASA officials said in a statement. The telescopes examined two black hole systems in the Milky Way in which a black hole is tearing material off of a normal star; this kind of system is called an X-ray binary. The systems were named V404 Cygni and GX 339-4. The observations included different periods in which the material that orbits the black hole, called the accretion disk, brightens as material is added to it. Both systems had a time delay of about one-tenth of a second between when NuSTAR saw a flare in X-ray light and when Ultracam detected the same phenomena in visible light. This is the length of time it took for the jets to "turn on" as visible light sources. According to the researchers, the X-rays might come from material that was closest to the black hole, where magnetic fields accelerate some of the stuff to high speed. Particles then smash into each other at close to the speed of light, energizing the plasma that blasts out into jets and causing it to visibly glow. "Where in the jet does this occur? The measured delay between optical and X-ray light explains this," NASA officials said in the statement. "By multiplying this amount of time by the speed of the particles, which is nearly the speed of light, scientists determine the maximum distance traveled." That distance was about 19,000 miles (30,000 kilometers) — just under three times Earth's diameter, according to the statement — before the plasma was energized enough to light up. The researchers said there is a connection between this measurement and the way even larger, supermassive black holes are understood to work; in one system, called BL Lacertae (200 million times the mass of the sun), astronomers inferred a time delay millions of times greater than for V404 Cygni and GX 339-4. This means the mass of the black hole likely determines the size of the acceleration zone. But more observations of X-ray binaries are planned to confirm the results. "Astronomers hope to refine models for jet powering mechanisms using the results of this study," Daniel Stern, study co-author and astronomer at NASA's Jet Propulsion Laboratory in California, said in the statement.